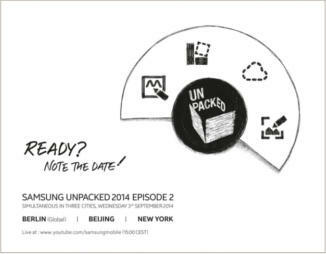 There is no doubt Samsung will announce the Galaxy Note 4 on September 3, 2 days before IFA 2014. This is the tradition of announcing Galaxy Note phones. Galaxy Note was announced in IFA 2011, Galaxy Note 2 in IFA 2012, Galaxy Note 3 in IFA 2013. But what are the specifications of Galaxy Note 4 and when will you get it? Smartphone usually is announced or launched (it is usually demoed as well in the event) before the release date. So, on September 3, you may have the chance to “see” Galaxy Note 4, but you surely cannot buy it. Because many of us may be eager to know when we can get the device (so does the competitors), Galaxy Note 4 release date is another top secret of Samsung. Based on Samsung’s track record, most Galaxy S and Galaxy Note smartphones are released about one month after they are announced. Because Apple will announce its iPhone 6 on September 9, the release date for iPhone 6 will be very likely within 3 weeks from September 9. Samsung may try to release the Galaxy Note 4 in the similar period to gain the momentum. So, Galaxy Note 4 release date will be very likely in late September/early October. Specification is not everything. But specification is still the most talked topic for any smartphones. Galaxy Note 4 has some awesome specifications if the rumor and early leak can be trusted. In tech world, yes, the rumors usually turn out to be the truth. Let’s tear down the Galaxy Note 4 specifications based on early leaks and rumors. Galaxy Note 4 specifications: CPU – Snapdragon 801 or Snapdragon 805? Snapdragon 805 is currently the most powerful processor or smartphone and tablet. This processor currently can only be found in Galaxy S5 LTE-A and LG G3 LTE-A for Korea market. So, very likely, Galaxy Note 4 will be the first mobile device equipped with this processor outside of Korea. So far, almost all benchmarks shown the impressive performance of Snapdragon 805. Of course, for some 3G versions of Galaxy Note 4, Samsung will very likely use its own Exynos processor as what they did in Galaxy Note 3 and Galaxy Note 2. Galaxy Note 4 specifications: display – Full HD or QHD? Full HD screen is the basic requirement for flagship smartphones in 2013/2014. Galaxy Note (1280*800) and Galaxy Note 2 (1280*720) has a 720p HD screen. In Galaxy Note 3, we got a full HD (1080p) display. Now for Galaxy Note 4, QHD (1440p) display should not be a surprise. Samsung already tested such a screen resolution in Galaxy S5 LTE-A (only for Korea). So,very likely, Galaxy Note 4 will come with QHD display (2560*1440, aka 1440p HD, or 2K display). There should be no supply or technical issues to roll out 2K display (QHD) in Galaxy Note 4. Galaxy Note 4 specifications: screen size -5.7″ again? All leaks indicate the screen size of Galaxy Note 4 will be 5.7″, which is identical to that in Galaxy Note 3. Just for your information, the screen size for Galaxy Note is 5.3″, 5.5″ for Galaxy Note 2 and 5.7″ for Galaxy Note 3. You may wonder why Samsung does not push the screen size to 5.9″. From Galaxy Note to Note 2 and Note 3, Samsung increases the screen size by reducing the bezel without increasing the overall size. In Galaxy Note 3, the bezel is almost reach the design limit and there is no room for reduction. Very likely, Samsung chooses 5.7″ screen size for Galaxy Note 4 to play safe. Galaxy Note 4 specifications: display – flat or curved? Samsung debuted curved flexible display with Galaxy Round. But the reception is not good. Probably there is no reason for Samsung to try a curved display in a popular phone model again. So, very likely, Galaxy Note 4 will get a flat display, not a flexible or curved display. Galaxy Note 4 specifications: display – Super AMOLED of course! One distinguished feature of Samsung’s flagship smartphones is the Super AMOLED display. Samsung, together with LG, owns more than 85% of the OLED technology (patents). But LG haven’t used such screen for mobile devices. Motorola is the only major smartphone vendor who also uses AMOLED screen (for Moto X). In most scenarios, OLED is arguably better than LCD (including the IPS LCD). You may check this article on the quick comparison of AMOLED and LCD. Galaxy Note 4 specifications: camera -13MP or 16MP or 20MP? More and more smartphone users now understands the number of pixels in the camera is not as important as expected. The overall image quality is more important. But this does not mean the hardware vendors stop chasing the pixels. Such a number usually can be bragged in marketing videos. Very likely, Galaxy Note 4 will come with a 16MP camera sensor, a small bump from Galaxy Note 3. To differ from Galaxy S5, very likely, it will have some hardware and software improvement. Galaxy Note 4 specifications: camera – OIS or not? Optical image stabilizer (OIS) is one of the most anticipated features of smartphones because more and more people rely on smartphones to take photos nowadays. LG already introduced this feature in G2 last year and G3 this year. The reception is surprisingly good. Samsung failed to add OIS in Galaxy S5. Very likely, Galaxy Note 4 will feature OIS. Galaxy Note 4 specifications: RAM – 3 GB or 4 GB or just 2 GB? Galaxy Note 3 is the first mainstream smartphone with 3GB RAM. This works tremendous well for multitasking in Galaxy Note 3. But to save cost, Samsung backpedaled to 2GB for Galaxy S5. This will unlikely happen to Galaxy Note 4. The question is whether Galaxy Note 4 will get 3GB or 4GB RAM. Very likely, Galaxy Note 4 will get 3GB only because very few Galaxy Note 3 owners complained about the RAM. Galaxy Note 4 specifications: sensors – UV sensor? fingerprint scanner? heart rate monitor? Heath and fitness is getting increasing attention. S Health is Samsung’s efforts in software side. Gear Fit and health/fitness related sensors (heart rate monitor, humidity monitor) in smartphones reflect the efforts in hardware side. In Galaxy Note 4, we probably will get a similar (ans simple) S Health app as in Galaxy S5. But in the hardware side, Galaxy Note 4 will surely get the heart rate monitor. Galaxy Note 4 will probably get the ultraviolet (UV) sensor. You will get the UV index information from your Galaxy Note 4 instantly. Almost certain, Galaxy Note 4 will have a fingerprint scanner. If you are dreaming Android L in Galaxy Note 4, you will be disappointed. Surely, Galaxy Note 4 will come with KitKat because Android L is still in preview stage. Galaxy Note 4 specifications: plastic or metal? Samsung likes plastic. They even made plastic gold. Galaxy Note 4 will be mainly in plastic as usual. Galaxy Note 4 specifications: battery -everyone knows it. One of the advantages of Samsung smartphones is the removable battery. Samsung even released a marking video laughing at wall huggers. Surely, Galaxy Note 4 will have a removable battery. The capacity of the battery usually is limited by the form factor of the phone. As Galaxy Note 4 will have a similar size as Note 3, it is safe to assume the size of the battery will be similar. The battery capacity improvement is mainly achieved through the battery density improvement. So, the capacity of Galaxy Note 4 battery probably is around 3500mAh. For the battery life, Samsung demonstrated its capability to optimize the battery usage in Galaxy S5. Very likely, Galaxy Note 4 will have at 10-25% longer battery life compared to Galaxy Note 3, although galaxy Note 4 packs more pixels in the screen. Galaxy Note 4 specifications: SD card support-everyone knows it. Surely, Galaxy Note 4 will have SD card support. You can pop in a SD card up to 128GB. Nothing new. This is another advantage of Samsung devices. What are you expected in Galaxy Note 4 specifications? What’s your opinion on Galaxy Note devices? Please let us know in the comment box below.